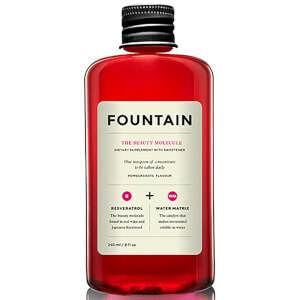 Keep your skin looking youthful from within with The Phyto Collagen Molecule from Fountain. With 5000mg of hydrolysed collagen in each 10ml serving, the supplement also contains wild phytoplankton, which contains over 65 nutritional properties that encourage cellular regeneration and fight the signs of premature ageing. Meanwhile, L-Glutathione provides powerful antioxidant protection, helping your skin to fight harmful free radicals. 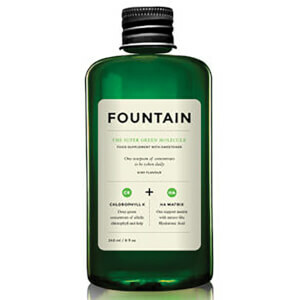 Featuring a delicious apple flavour, Fountain The Phyto Collagen Molecule also contains hyaluronic acid to enhance the tissue's water retention capacity. Suitable for both adult men and women, this beauty supplement is also free from artificial colours and flavours. - L.M. Water, Sweetener Xylitol, Hydrolysed Collagen, Natural Flavor, Preservative Citric Acid, L-Glutathione, Marine Phytoplankton Extract, Hyaluronic Acid, Preservative Potassium Sorbate.